Ed and Dee Lusby of Tucson, Arizona, are at the center of both a growing controversy and a new philosophy of keeping bees in the U.S. The emphasis Ed and Dee place on feral bees, their ideas about the effect of honey bee worker cell size on bee health and vigor, and their promotion of a ’natural‘ 4.9 millimeter cell size run contrary to conventional wisdom in the beekeeping industry and seemingly seek to undo a century of progress in North American and European bee breeding. The apparent success of their bee operation without any use of chemical treatments is truly remarkable at this time when many beekeepers feel that the experts are running out of answers and that we need to escape the pesticide treadmill. Therefore, when Dee invited us to visit and see for ourselves, my neighbor, Joe, and I jumped at the chance; we stopped by Lusbys‘ when we were in Arizona for the American Honey Producer’s convention in January, 2002. When we arrived at their gate in a Tucson industrial area, Joe and I expected to spend a few hours and go on our way, but, as it turned out, we spent three very full days with the Lusbys and their bees. 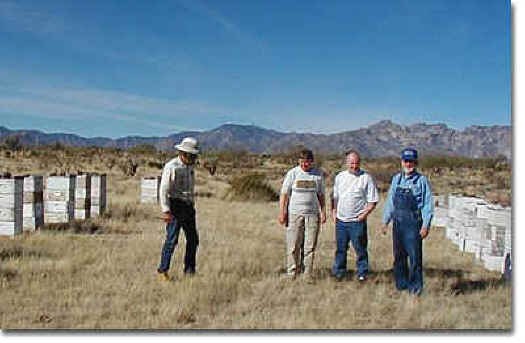 During those three days, we helped make foundation by hand, visited seven of their yards in the remote Sonora Desert west of Tucson, opened over 100 hives, closely inspected about 30 of those hives, and had a chance to hear many of Lusbys‘ ideas explained in detail – and to debate some of the fine points. We had a wonderful time. We discussed bees from morning to night, and learned how quickly Dee can pull out tapes and documents from their extensive library when they are needed to support her ideas. On our first day, we examined the bees at their yard in town and made foundation with Dee using a manual dipping technique and a hand mill. On the second day, the Lusby’s, Lee (a beekeeper friend of Lusbys from New Mexico who also uses 4.9 foundation), Joe and I headed west towards the mountains in their rugged, desert-customized Chevy van to see how the bees in the distant yards were doing. Although Lusbys keep a few hives in their Tucson work yard, most of their hives are located on remote desert ranches over forty miles from the city, measured as the crow flies. By road, the journey is more like 60 miles to the nearest yard, and after the first fifty or so miles, the last few are rough miles, requiring a tough, high clearance four-wheel drive vehicle. Since it was Winter, Ed and Dee had not been to some of their yards for a while and they found our visit a good excuse to make sure everything was okay in the distant locations. Periodic visits are necessary since animals such as coatimundi, a raccoon-like high desert animal, or hunters from the city sometimes overturn or damage a few hives. Sure enough we did find a few hives down, several from animals and several from two legged varmints. We also observed the scratching at hive entrances that is characteristic of skunks or coati, and bullet holes and four-wheeler tracks that are characteristic of some kinds of hunters. Most hives were okay when set up again, but one or two had been robbed out. In spite of that, the bees in most yards were not especially cross. Dee placed small, sharp rocks around the entrances boards of the hives the animals had singled out and said that usually stops the scratching by making the ground too uncomfortable for the coati. Not much can be done about humans, although the gates are locked and the area patrolled by ranchers and by the Border Patrol. We spent two full days looking through Lusbys‘ yards, and in that time we saw lots of good-looking bees and brood, one small swarm which left for parts unknown while we watched, no significant brood disease, and very few Varroa mites. With Ed and Dee’s encouragement and assistance, we opened hives more or less at random, both in their home yard and in their desert yards. If Joe or I saw a hive that we thought might be in some way different or interesting, we opened it. We were in Tucson in mid-January, and the weather was mostly in the 70s. Some nights got down close to freezing, and the chill lasted well into the morning. Tucson had snow not long after we left. Since January is Winter in Tucson, the hives were not at full strength. At times we found the bees clustered, depending on time of day and the location. In most yards, there was a light flow coming in and flight was usually underway by noon. The clusters varied from a couple of frames up to a couple of boxes of bees, with about five frames of bees and several good frames of sealed brood being the median size. We made note of some hives that need splitting soon, and saw one small swarm on a low bush when we entered the yard. It was obvious by the surface bee activity on the swarm that they were about to leave, and sure enough, we were unable to hive them. They left, headed west. All Lusbys‘ hives are well maintained and on individual floors in two rows in each yard. With few exceptions, each hive, no matter how small or large, is kept in four standard boxes. This keeps the supers safe from moths and allows room for the bees‘ normal explosive Spring growth. Having lots of room means there will be no Spring rush to get boxes to the field (the roads could be washed out), and no danger of triggering swarming by overcrowding the better hives. In the desert near Tucson, the climate is mild enough that the bees don’t mind the extra room. Most hives were raising brood in the second box when we examined them, leaving the bottom and top two boxes less occupied. In many cases, the top boxes were foundation. On average, each hive we examined had only a frame or two of feed, and very little nectar around the brood compared to what Joe and I are used to maintaining in our colonies in Western Canada. Joe commented that the hives were a bit short on feed by our standards, but we are from the north and in the Tucson area, unlike Alberta, flows come and go all year. Moreover, Lusbys deliberately breed for bees that can support themselves and do not care to encourage uneconomical queens. Although they gave occasional frames of honey to hives that were getting established, they don’t feed whole yards as a routine practice the way we do up north. Although the bees were not as tame as some Caucasians I have owned, the Lusby bees seemed quite docile to me compared to the Australian and New Zealand imports and Hawaiian offspring we manage in Canada, and I teased Dee about having ‚wimpy Killer Bees‘, since the authorities claim that Arizona is ‚Africanized‘. Dee has other theories about the origin of their bees and the dominant genetics of the bees they manage. Maybe Lusbys‘ bees are worse when they build up for Summer, but in terms of temper, I found them pretty much exactly what I have come to expect when visiting yards through Alberta during 30 years as a commercial beekeeper and, years ago, as a bee inspector. Although the Lusby bees were not particularly defensive, and did not run on the combs or attack en masse, they seemed quite quick-moving and hardworking. With few exceptions, they stayed nicely on the comb when we worked them and did not seem much disturbed by our examination. We did, however use smoke constantly to ensure that we did not need to suit up completely and the bees responded very nicely to the smoke. The fuel was bits of wood from desert shrubs that we found and chopped up into small bits. Although the wood seemed quite hard, it smoldered well, made good smoke, and did not go out. The brood patterns we encountered were, almost without exception, very solid and well laid. Adjacent pupae and larvae were always the same age, a sign of fertile and active young queens. Any queens we saw tended to be mostly black. Dee raises queens from their favorite stock, which is kept at some of their most remote yards. When raising queens, she hatches the virgins in an incubator, examines them, mates or introduces those she thinks are good, and makes up a swarm lure mixture by crushing the ones she does not like. She selects queens by looking for color, shape, and particular markings that mean to her that the queen carries the characteristics she seeks. She says that she likes the queens she calls ‚Tootsie Roll queens‘, and calls them that due to their unique brown markings. When installing virgin queens, she just smokes the hive so that smoke is coming out all over, then runs the virgin in. Some types of bees will kill queens introduced this way, but Dee says the strain they have accepts the virgin if it is done right, and the virgin will mate and lay alongside the original queen in most cases. In addition to this tolerance of extra queens, Dee claims their stock has other unique characteristics. She and Ed have observed that thelytoky is a distinct trait in their bees. Reportedly, previous generations of the Lusby family were also aware of this characteristic in their bees and have always regarded it favorably. Thelytoky is the characteristic that allows unmated worker bees to lay fertile eggs that develop into females, not drones as one would expect. Thelytoky permits hives that would normally be hopelessly queenless to requeen themselves using worker eggs, and Lusbys claim their bees often do just that. As we worked through the hives together, Dee pointed out that she considers it important to have at least one sub-family of small black bees in each hive. We looked, and, yes, there seemed to be a correlation between the better hives and the presence of at least a few small black bees. She said that a black contingent is necessary in each hive to have the hive exhibit the Varroa and disease resistance they seek. I gathered that it is not just any black bee she wants, but she is looking for particular characteristics that are apparent to her. In one particular hive at a distant location and a higher altitude (3,470 feet), I saw remarkable little black bees with wings longer than the bees – to the extent that the wings actually stuck out behind the bees. My camera was not available and I regret not having taken a picture. I guess I’ll have to go back sometime. Joe and I were particularly interested in seeing for ourselves the Varroa and tracheal control without chemicals that Lusbys attribute to the use of 4.9 mm foundation, and we were not disappointed. We were unable to evaluate the tracheal resistance, other than deduce success from the fact that the bees were thriving. Tracheal mite load analysis requires dissection of bees, but Varroa is easier to see, and normally the results of untreated hives being exposed to Varroa are predictably sad. 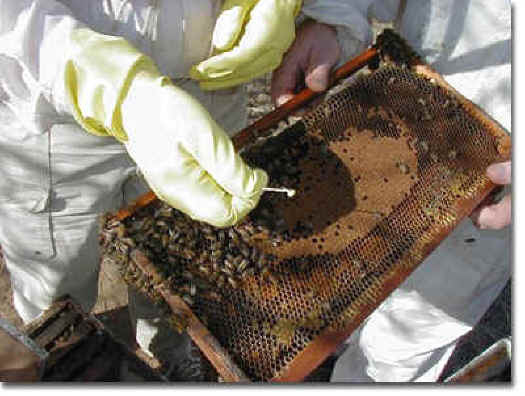 Hives that have not been treated for Varroafor years – if ever – should be dead. These hives definitely were not dead. You had to look hard to find Varroa, and then it would only be one/cell. Although, by careful searching, we did find a few Varroa, not one of the 20 or so Varroa we found in that whole time was phoretic (on an adult bee). Moreover, not one mite in any cell we examined appeared to be reproductive and every mite we saw had already been located by the bees and made obvious to us by the fact that the bees had uncapped the cell. In some hives, the bees had uncapped a few cells here and there on patches of capped brood. The only mites we found were in uncapped cells, and those cells appeared to be at some stage of being cleaned out by the bees. In those few uncapped cells, we would almost invariably find a single foundress mite all by herself on the pupa, usually at the colored-eye stage. Some of these cells were just uncapped and others were partially emptied. Where the cell was only uncapped, Dee said that the mite had been on the head of the pupa. Where the pupa was chewed down, the mite was assumed to be further down. When we pulled out such pupae, we always found the mite. We never saw more than three or four of these opened cells on a frame. Out of curiosity, wondering if the bees were smart – or just lucky – we opened the capped cells around some of these cells with uncapped pupae where we found a mite. We never found a mite in a surrounding capped cell, or any capped cell for that matter. We also observed that as we withdrew the contents of cells on a straw, nearby bees would immediately investigate what we had on our probe. Since it was Winter, there was no noticeable drone brood at the time of our visit, although Lusbys deliberately encourage up to 10% drone cells on a frame by having the foundation stop about three eighths of an inch above the solid bottom bar. Therefore, we were unable to examine drone brood for mites, but I doubt we would find many. The cell bases impressed on the midrib of Lusbys‘ style of foundation measure slightly less than 4.9 mm across on average. Lusbys prefer a foundation with no cell wall, but a fairly thick base, and they say the bees use the wax from the midrib to make the first third of the cell. Lusbys use no vertical wires, but do use four horizontal wires, which are strung tight and which they crimp with a European-style hand crimper. The frames we saw them converting to 4.9 were mostly recycled from their previous combs. After moving from conventional 5.3 and 5.4 mm combs down to 5mm, they decided that the larger comb – even 5 mm – was just not working for them, and have melted almost all their larger caliber comb down to refit the frames with 4.9 foundation that is made from the melted combs. The used frames have been tightened and rewired if necessary and are as good as new. To install the wax sheet, they lay the wired frame flat and connect to the ends of the wire with electrical contacts. An old iron element functioning as a resistor drops the line voltage and limits the current to what is needed to heat the wires. They settle the wax onto the wires and press the wax to the correct depth onto the hot wire with a deft motion of the hand. The result is a tight, flat sheet of well-embedded homemade 4.9 foundation. I saw these sheets on the hives both drawn and being drawn, and was impressed at how well it is drawn and how flat the combs stayed. The homemade foundation is very good. The Lusby family has been in bees for generations, and Dee has worked with bees since she was a girl. The family takes their beekeeping seriously. It seems that almost all activity in their home revolves around the bees and bee books. Over the last decade, Lusbys suffered twice through high bee losses, once from tracheal mites and once again from Varroa. These losses were exacerbated by serious droughts in their area. Through all this, they have maintained their belief that with the correct management and selection, bees can survive and thrive without chemical aids or use of expensive and fussy proprietary purebred queens, if they are selected and managed properly. It seems they now have succeeded in finding a system that works for them. Since the days of heavy losses, Lusbys have steadily built their hive numbers back up and are now at a point where Dee and Ed dream of sharing their success, their stock and their ideas with as many other beekeepers as they can. While they don’t want to see their stock patented or exploited, they would like to sell nucs when they have surplus bees, and that could be soon. They are producing honey again and are able to offer their product market as totally chemical-free. I think we all would like to be able to do the same.